There many occasions when we would like to copy the long path of file or folder to clipboard for further use. The file or folder path can be copied by manually opening the explorer or path of the file or folder can be found out by right clicking file or folder > Properties. Both the above mentioned ways can become a pain if we have to do it frequently, Windows Vista comes with an inbuilt feature that can be used to copy the path of file or folder directly to clipboard. Let us see how we can achieve this. 1. First select the file or folder for which you intend to copy the path. 2. Now hold the shift key and right click on the file or folder. 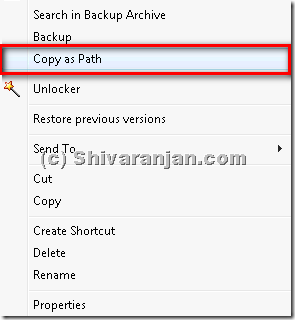 Now you should see an option called “Copy as Path”. That’s it the path of the file or folder now should be copied to the clipboard. Now just paste the copied path where ever you intend to use. you can do easily by using long path tool, it works fast and easily.